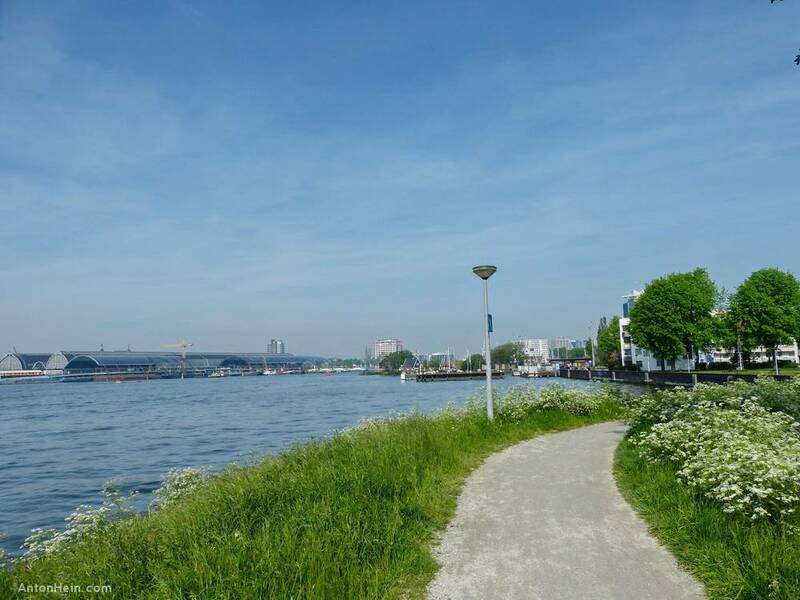 One of our favorite places to relax in Amsterdam is along the river IJ. (In Dutch those two letters together act and sound like a single one. Pronounce it somewhat like the i in icecream). A great spot along the IJ is the Noordwal (literally, North Wall), an unpretentious promenade right alongside the busy waterway. The river provides an ever-changing scenery, with all manner of boats and ships sailing by within shouting distance: from the tiniest dinghies to the huge cruise ships, from luxury yachts to commercial barges, and from passenger ferries to tall ships. In the distance is Central Station on the far side, and Al Ponte — a genuine Italian-style Coffee Kiosk — on this side. The ferry to and from Central Station (a free, 3 minute ride that’s just plain fun), arrives and leaves right across from Al Ponte, so you have no excuse to not try the wonderful coffee they serve there. Many people, ourselves included, consider it to be the best coffee served in Amsterdam. Their hot- or cold sandwiches are also very good. A little further East there is Wilhelmina-dok, an odd-looking, bright orange restaurant, with wonderful, sunny terrace right at the waterside. The name of the place is a reference to a shipyard that was located here until the 1980s. It’s a fantastic restaurant… but while they serve a decent cup of coffee, we much prefer the coffee served at Al Ponte.